An unexpected historical find has highlighted the efforts of a documentary-making dive team. Manly’s Winston Cowie has discovered a yet- to- be determined Maori tool at Tawharanui while helping to make a documentary series. Mr Cowie was diving as part of a team filming the Natural History New Zealand and TVNZ series Our Big Blue Backyard, which will show on TV1 next year. Three of the four person North Island team are from Rodney: Brady Doak ( cameraman and marine operations at the University of Auckland Goat Island facility), Steve Hathaway (videographer and Snells Beach local) and Mr Cowie – a marine scientist, independent film maker, author, lawyer and dive supervisor. Whangarei-based cameraman, independent film-maker and marine scientist Dave Abbott completes the team. Mr Cowie was looking for a crayfish nest in 4m of water when he saw what looked to be ‘‘ a funny looking mussel’’ lodged between two rocks. 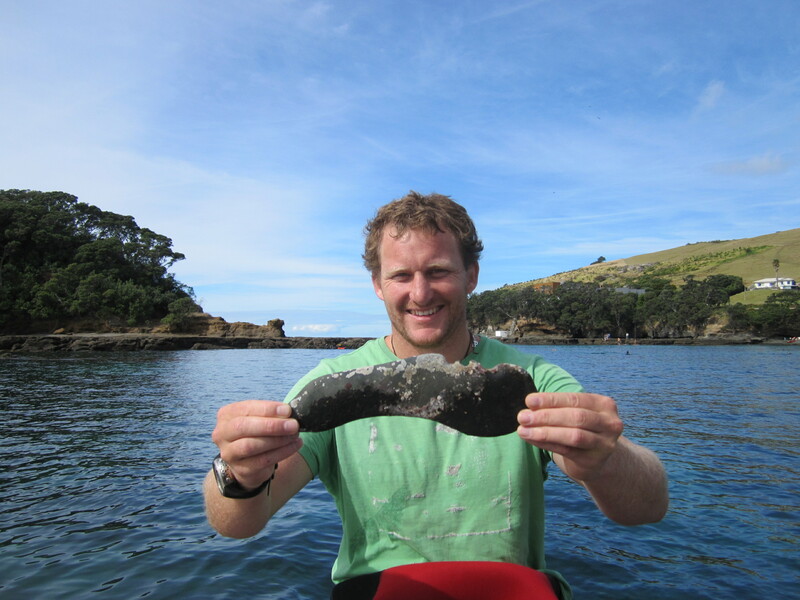 He pulled it clear and was surprised to find a curved stone Maori tool and had a lot of marine growth on it. It had obviously been there ‘‘ for some time’’. Winston Cowie & the Maori artefact - a fishing tool? 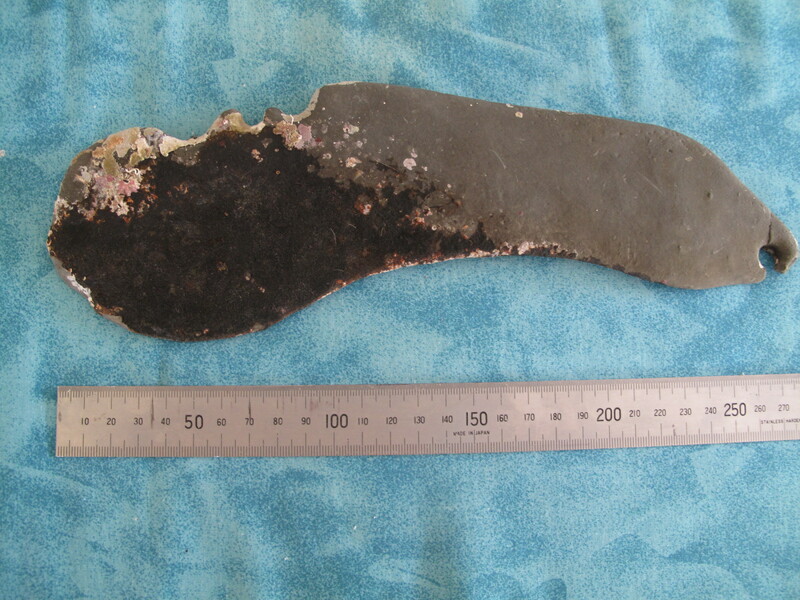 Maori artefact discovered at Tawharanui - a fishing tool? ‘‘ My initial thought was that this was some sort of finely shaped multi- purpose fishing tool – the three notches on it used to tie the flax line, with the hole at the other end used to tie the line to the handline,’’ Mr Cowie says. ‘‘It is also sharp and would be good for scaling fish. Another idea was that it was part of a fish/ crayfish trap located on the bottom. Mr Cowie met Ngati Manuhiri kaumatua Mook Hohneck who said a karakia and blessed the taonga. 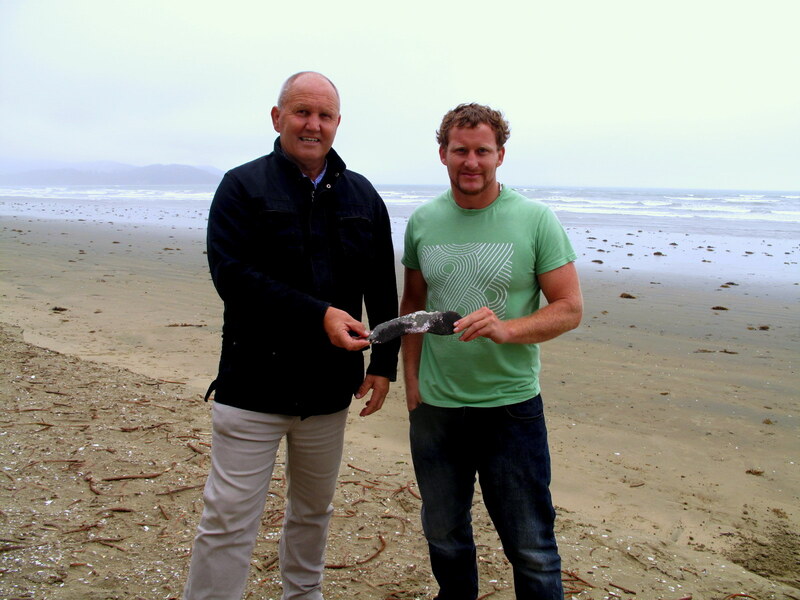 Ngati Manuhiri Settlement Trust chief executive officer Mr Hohneck confirmed the artefact belonged to Ngati Manuhuri and was grateful to Mr Cowie for returning it. It would not have been a weapon, such as a mere, he said, but could have been used for fishing or collecting shellfish off rocks. By Kerry Gallagher, Rodney Times, 25 April 2013. First Editions, however, become collectors items. Grab one today!